So, in the field of particle physics there are a kind of diagrams called Feynman diagrams. Please search "Feynman diagrams" in google to see how they are if you don't know them. There are some "patterned curves" that I really do not know how to create in inkscape; these are presented and indicated below. I am hoping this question will serve as a reference for any one else interested in drawing Feynman diagrams with Inkcape. Select "Bezier Curve". Holding down "ctrl", then "right-click" and trace a horizontal solid line. In order to add arrow in the middle, select the line and then the option "Edit paths by nodes"; double click in the middle of the line in order to add a node just there. Then go to "Object" and select "Fill and Stroke...". In the "Stroke style" tab, select a middle arrow in "Markers"
Create a fermionic line. Then in the "Stroke style" tab, select a dashed pattern in the "Dashes" option. This line I build according to the method provided by the user "Beenwu" (here) on YouTube. Go to "Extensions", then "Render", then "Parametric Curves...". Enter the following values. With the tool "Create rectangles and squares" create a rectangle, and then click on "Apply". Analogous to the gluon case, only this time you have to enter different parameters indicated in the above link. I can use the tool "Bezier curve" to draw fermionic and scalar curved lines, but I do not know how to do it for gluon and vector curved lines. 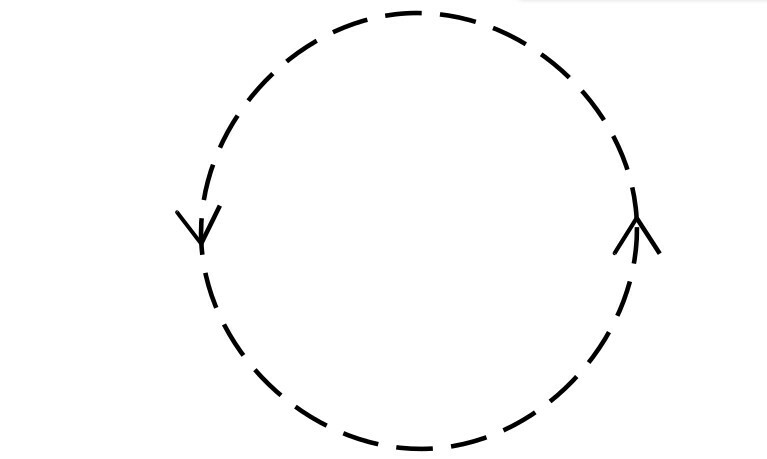 3.- Loops: the same four above lines but in the form of a loop, i.e. I draw the fermionic and scalar loops with the tool "Create circles, ellipses and arcs", but not shure how to add those two arrows like in the above image. I do not know how to draw those gluon and vector loops. Draw a circle. Convert it to a path (Path > Object to Path). Select proper stroke thickness, color and dashing. Click in the info panel option break path at selected nodes. The parts can be selected individually and moved apart (if needed) after applying Path > Break apart. They can be moved easily together if you have snap to nodes ON. The parts are separated in the middle to show, what I mean. Warning: Grouping isnt't watertight. Double clicking selects still only one part and the group can be trashed by partial edits. Learn to use the Objects panel for selections. From there you can easily select the wanted part and see what is selected. For shaped stroke circles there's no need to draw a circle with the pen. Convert normal circle to path, add path function "Pattern along path". Have your parametric curve or other shape in the clipboard. Select pattern source option Link to Path On Clipboard. NOTE: If you want to have grouped or colored shapes placed along a path, use Extension Generate from Path > Pattern along Path. 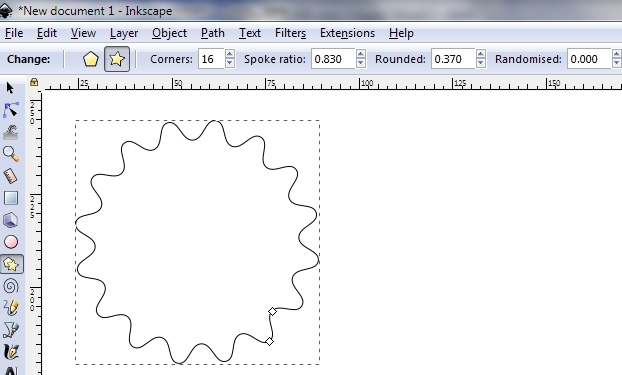 See Inkscape manual for details. They differ from the same named path function. How do I increase the width of a curved line drawn using a bezier pen? 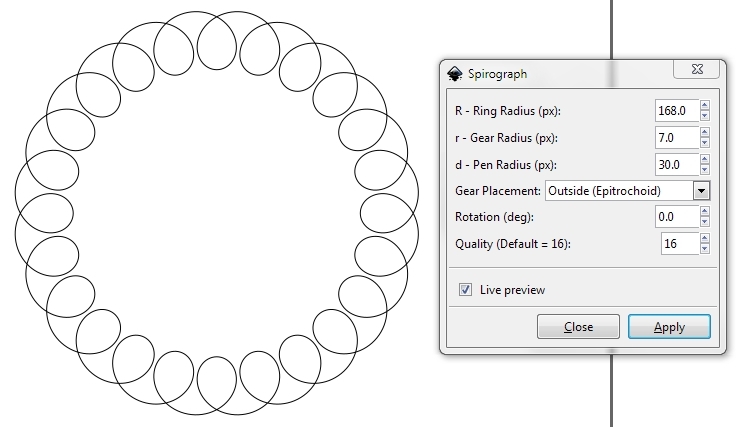 How do I draw a curved 3D line in Inkscape?